There seems to be some debate as to whether this clip comes from an actual university study or maybe it's just a cool trick of the mind. Either way, it's pretty cool that you can read that entire letter with only the first and last letter of each word in the right place. Okay, so we've had a grand total of 3" of snow in Clayton this year. I had to drive 300 miles south to find some real snow. Here's the scene outside of my in-laws in NJ after 24" of snow last night. There is a great deal of talk about the direction of the internet over the past few days with pending FCC rulings. While this chart doesn't relate to those issues it does highlight the future of the internet as many industry players see it. Basically, the major players want the internet to become similar to the cable model - where you get what you pay for. If you want youtube - pay up, facebook - pay up, google - pay up. This chart comes from a firm that sells software to monitor web usage and offers their vision for charging you for what you use. The irony of one of the companies providing this slide is being called OPENET is apparently lost on them. While this could be a huge boost to the telecom/cable providers (ATT, Verizon, Time Warner) I think this would be a huge negative for the US and it would further limit our standing in the wired world. 1) The US has close to 1,000 military bases, stations and outposts around the world. 2) While our defense budget is a staggering $711 BILLION, there are estimates that we spend another $600 billion/year in "off-budget" military items for a total $1.3 trillion. That's insane. We can't have a serious discussion about our budget woes without at least admitting that the above chart is a little out of whack. 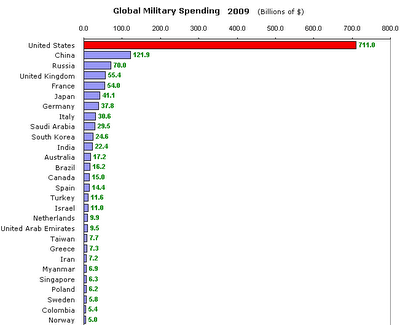 Cut our defense budget to $250 billion and it still would be twice that of China. I think we can still support our military personnel without taking out a payday loan at 48% interest for the next 78 years. EUROPE BURIED UNDER 3 INCHES OF SNOW! SURPRISE - IT'S COLD IN NORTHERN NY IN DECEMBER!!! The headlines are screaming at us to take note of the terrible winter weather around the globe. However, this chart clears things up a bit in my opinion. This map is centered on Greenland and it shows departures from historical norms. Red is warmer than normal and blue is colder than normal. 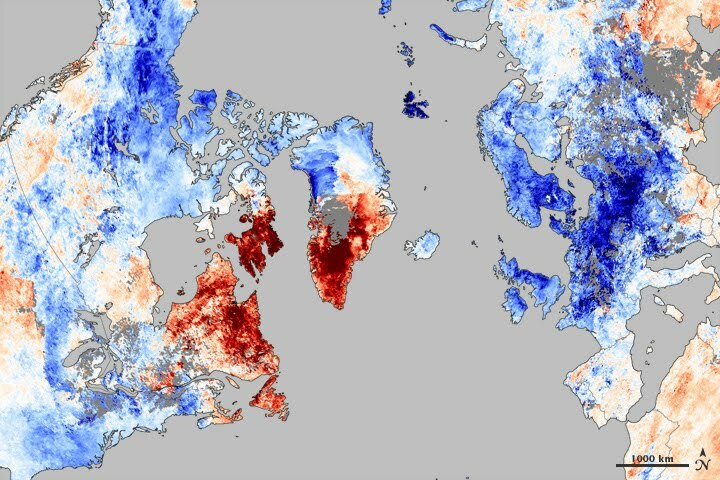 This shows that a powerful high pressure (warm weather system) remains planted over Greenland and that is causing much lower temperatures in Europe and the Northeast of the US. However, since there are only about 12 people that live in Greenland or the Canadian Maritimes - where it's much warmer than normal - and there are millions of people in the Northeast US, UK and France - where it's colder than normal - the news seems to be skewed toward "We're all going to freeze to death" :). "US Stock Futures Gain On Heightened Korea Tension"
1) D'Artagnan Premium American Kobe – Style, Wagyu Beef Prime Rib Roast for $199 or $28/lb. Hurry and buy today for the Investment Banker on you Christmas list while it's $80 off! 18,485 Total Servings. I'd say hurry and buy this today for your crazy uncle who lives on that compound in Montana but they are SOLD OUT of this at $2,999. Well, those are the sobering stats from the latest Department of Labor press release on November Unemployment figures in NYS. For those of you that have forgotten your 4th grade Social Studies class there are only 62 counties in NY State so for Jefferson County to be 58th in employment and St. Lawrence County at 61st (only the Bronx has a higher unemployment rate) is not a good thing. Just in case you thought it was specific to our area Franklin is #48, Lewis is #50, Fulton is #59, and Oswego is #59 (tie). I've noted before that given our small population base a few job losses can really swing our unemployment rates wildly, but the November jump seemed to be fairly broad and pretty severe. 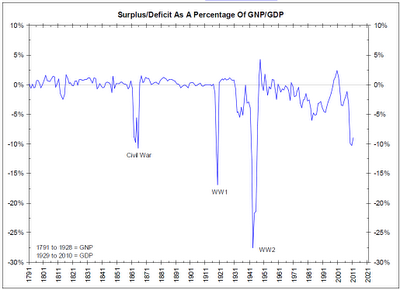 I'm trying to find historical data and I'll let you know if I get any info that might provide a little context. It's just anecdotal right now but there are some crazy discounts coming out of the major retailers with a week to go before Xmas. I don't know what it says about the holiday shopping season but big ticket items seem to be the ones that are getting cut very aggressively. Congress passed the tax deal last night and you can now officially ignore any congressman in the future that promises to work on the national debt if he voted for the tax cut. That tax cut just added $800 billion to as much as $5 trillion to the national debt. Some things are fact and are not open to ideological interpretation however, many of the pundits and politicians on TV have heard or said the lies so often that it is now taken as truth. "Tax cuts spur growth". Try again Chachi. I love targeted tax cuts and incentives that spur job creation, but the carpet bombing style tax cuts passed last night will do little to incentivize new growth particularly when the rest of the world wakes up to see that we aren't serious about our debt situation and our interest rates keep moving up. For the record though Amazon survived the dotcom crash and 10 years later was actually above it's 1999 stock price. Very, very few of their fellow dotcom companies were so lucky. I found this story on the 1010WINS website to be oddly timed (basically, they are local news in New York City). "Terrorists detonating a nuclear bomb in New York City is considered a remote possibility, but the federal government still wants you to be prepared. The feds are delicately urging emergency officials to spread the word. So, how can you stay alive? Given the incompetence of "terrorists" lately (underwear bomber - dud, shoebomber - dud, Times Square bomber - dud, Swedish bomber - dud) the idea that a terrorist could not only secure, but deliver a real nuclear weapon to a major US city is as laughable as a plot line in 24 with Jack Bauer, but the prominence of this story on their website is surprising. Update: Clearly this is a story that the NY media has been told to focus on. A similar story: "New advice for nuclear strike - don't flee get inside" is now among the top stories on the NY Times website. Probably just someone looking to cover his ^#$ in case anything ever does happen. * The Build America Bond expiration has many states sweating at night. The big states like NY, NJ, CA, IL and TX were all pushing their Congressional reps to approve this act, but it seems like it's dead in the water. If we fail to extend the BAB program (a bad program that I don't support) the consequences could more than offset the perceived "benefits" of extending the Bush tax cuts and unemployment benefits. A related story yesterday came from California when newly-elected Gov. Jerry Brown basically said "I'm shocked. The mess is much worse than I thought." I imagine our own newly elected Governor is having a similar revelation (however, massive bonuses on Wall Street this year might soften the blow for NYS). * Today's data dump - unemployment claims were about in line (slightly down, but still elevated), but the number of people claiming unemployment benefits during the last week of November jumped by over 800k people. This seems like an unusually large move. * Surprisingly, mortgage applications plunge as rates rise. "The Refinance Index decreased 0.7 percent from the previous week. This is the fifth straight weekly decline for the Refinance Index. The seasonally adjusted Purchase Index decreased 5.0 percent from one week earlier." * Here's a pretty cool clip of a lighthouse on Lake Erie that was covered by icy mist during the winds of the past couple of days. * The markets have sold off in a flurry of volume 2 days in row after 3pm. This seems to be fitting with market data that indicates major players have set up substantial short positions for the first qtr of 2011. It's worth watching if this is a blip in the radar or the beginning of something. * The treasury market and municipal bond markets have been getting slaughtered over the past couple of weeks. You might be saying - so what? Well, here's why it matters - there has been an unprecedented rally in treasuries in the past few years and it's become the "safe" investment for many investors. A decline in treasuries would hurt many risk averse investors. The bigger problem might be for all of us. The US has been financing it's spending splurge of the past decade by issuing a pretty steady stream of debt to refinance existing debt. This works great when rates are falling. However, when rates start rising that means the Federal budget is going to start jumping up due to interest rate costs which we have no control over. This could be a huge story in 2011. The municipal market is in complete disarray right now because the Build America Bonds program appears to be in jeopardy. In concept, this was a way to lower the cost of financing for states and municipal governments because the Federal government said they would fund 35% of the cost of the muni's interest expense. The Federal government decided they'd tax this interest at 35% and it would be a wash to the government. Unfortunately, it took Wall Street about 12.9 milliseconds to see a loophole in this plan. "What if we sold these bonds to overseas investors that aren't subject to US Taxes? They'd get the Federal kicker and they don't have to pay the tax!!!" I've seen reports that suggest up to 30%-40% of the $250 billion of Build American Bonds were purchased by overseas investors. This makes a potential wash, suddenly a costly new government plan. Grrr, foiled again by those meddling kids (on Wall St)!!! The bigger concern from my perspective is that it appears the investing community has taken the Federal government's interest kicker as an implied backing. The thinking seems to be "well, they didn't let Fannie and Freddie go under so they won't let NY, CA, or IL file for bankruptcy." That's a slippery slope. * On a related subject as treasury bonds have fallen in price and their interest rates have risen, this has effectively pushed mortgage rates back over 5%. This isn't a huge move yet, but many people liked the idea of having 4.5% mortgage rates and that seems to have frozen many potential homebuyers. * Some great satellite imagery of the ghost cities in China. *Former Reagan budget director offered up the quote of the day: "We have had a Fed engineered serial bubble, that has created the appearance of wealth, that has caused people to consume beyond their means through borrowing, and that has flushed the income and wealth of our society up to the top, as a result of the Fed turning the financial markets into a casino. These are pure casinos, they are not capital markets, they are not adding to the productive capacity of our economy, they simply are a bunch of robots trading with each other by the millisecond as a result of the Fed giving them zero cost overnight money, and giving them all kinds of hand signals on what to front-run." * According to American Express - 84% of Americans haven't finished their shopping yet. Wow, if that's even close to being true you won't catch me within 20 miles of a mall over the next 2 weeks. Thanks for all of the tips on Primary Care doctors in NNY. Keep them coming - so far, I've got a couple of good leads, but I'm always open to more options. Remember all of the videos of people climbing all over one another to get their $499 flat screens at Best Buy on Black Friday? Oh, well apparently that's all they are buying because Best Buy's results were dismal. The question for everyone will be is this a one off miss - is Best Buy getting dinged by Walmart, Costco, Sam's, Target - or are people reigning in spending? The Congressional vote on the tax break extension/Stimulus 3.0 will be watched closely today and could lead to another pop in the markets. * The tax deal compromise in DC is clearly another stimulus plan that everyone in Washington loves because it's a stimulus in sheep's clothing. This won't have the negative connotations that came with voting for TARP or the stimulus 1.0 or 2.0. * Trade deficit shrank which will goose Q4 GDP estimates in the US. * Consumer confidence rose last month and is now at it's highest point since June. * Diesel shipments up a bit year over year, but still down from July indicating a slowdown overall in the economy. * Glass half full or half empty story - Rental vacancies fall (good) as more people lose their homes (bad). * The spread between smart money and dumb money (according to various data inputs) is at it's highest level since the 2006. This should start to concern some market observers if this trend continues. "By some industry estimates, as many as 10,000 people in China are doing speculative day trading of American stocks — mostly aggressive young men working the wee hours here, from 9:30 p.m. to 4 a.m., often trading tens of thousands of shares a day. “Trading groups have exploded into China,” says Stephen Ehrlich, chief executive at Lightspeed Financial, a New York company that sells trading software to firms operating in China. 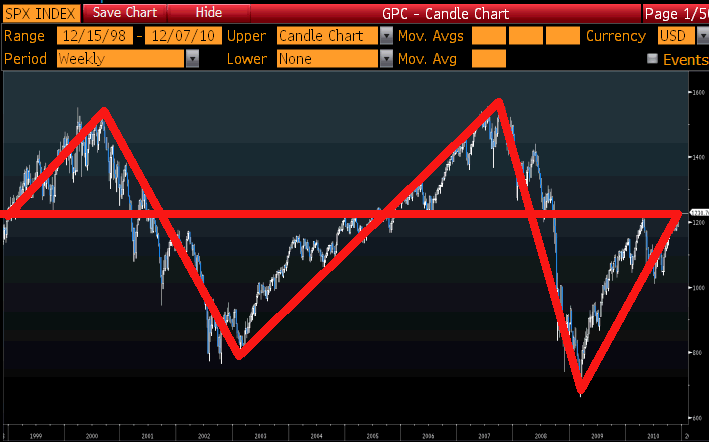 I thought this chart might be informative to look at the recent history of the stock market over the past 12 years. If you bought stocks on 12/31/98 you are basically back to square 1. Over that period the market has rallied 68%, fell 50%, rally another 100%, another 58% drop and an 83% jump. Buy and hold has gone nowhere over the past 12 years but a trader identifying trends can capitalize on the way up and down even if the market goes nowhere. PS - I figure after 1000+ posts, I can ask a favor of my readers. Can anyone recommend a smart, local primary care physician in NNY? I still have my primary care physician in NJ and that has worked well when all is well, but when the occasional sickness strikes the homestead it's hard to plan a 315 mile visit to my doctor. Feel free to offer up suggestions in comments or shoot me a message. The global markets have jumped sharply to the upside this morning on the word of our "kick the can plan....." I mean, tax compromise. The sad thing is that on the evening news tonight you are only going to hear about how the stock market made you richer today after this deal. You probably won't hear how this further weakened the US dollar which pushed oil over $90/barrel for the first time in over 2 years. Oh, and that probably means $3.40-$3.50 at the pump in NNY by Christmas, so if you drive at all in NNY your payroll tax cut is probably going to get eaten up by Exxon and BP. I'm not sure if many people caught this spoof ad over the weekend from Hugh Jidette (aka Huge Debt) portraying him as the first candidate for the 2012 election. It's pretty clever. Let Our Kids Pay from Peterson Foundation on Vimeo. It's from the Peter Peterson Foundation and I've always found Mr. Peterson to be one of the smartest, most honest people in the financial world. He could become a major player for independent candidates in the 2012 election cycle. Well, remember of the bluster about controlling spending and cutting the deficit during the campaign that ended all of a month ago? Yeah, austerity is sooo 2010, we've moved on. "The package would cost about $900 billion over the next two years, to be financed entirely by adding to the national debt, at a time when both parties are professing a desire to begin addressing the nation’s long-term fiscal imbalances." * It would reduce the 6.2 percent Social Security payroll tax on all wage earners by two percentage points for one year. For a family earning $50,000 a year, it would amount to a savings of $1,000 or $20/week. * In addition, the agreement provides for a 13-month extension of jobless aid for the long-term unemployed. Wouldn't it be easier to just have the government mail an iPad to everyone in the US and cut out the middle man? Seriously, it appears that neither party has any political will to make any hard choices. The Republicans need to understand that taxes have to be raised on those earning over $1 million and the Democrats need to curtail spending. Instead, it's more tax cuts and debt for everyone. 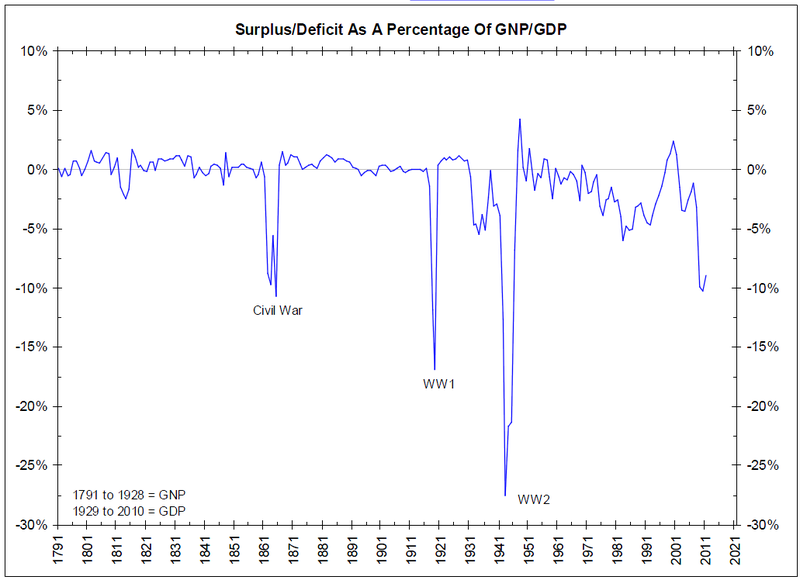 We've been cutting taxes since 2001 and look at that cliff it's created in this chart of the deficit as a percent of GDP. What is it that Einstein said about doing the same thing over and over and expecting different results? Stat of the day: Number of the world's top 100 buildings in the US. In 1990 - 80 out of 100 were in the US. In 2012 - 18 out of 100 will be in the US. I'm a sucker for data presented in a cool format and this video hits on all cylinders. The video starts off a little slow but after the first minute you won't be disappointed. 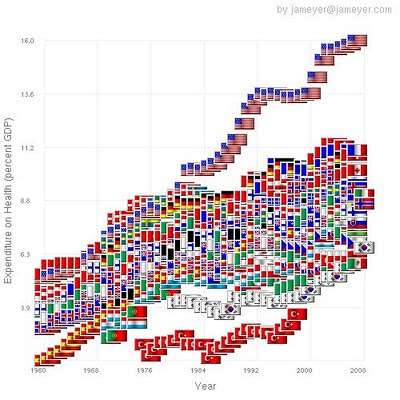 The impact of this graph on the US is not the focus of the presentation, but I think you can see how America will be challenged in a world where everyone is healthier and wealthier. Good stuff - btw: if you get the posts via email visit http://www.grindstonefinancial.com/ to view the video. This chart is pretty self-explanatory but it really shows what an outlier we are when it comes to healthcare spending. The rest of the world is neatly clustered spending 6-11% of their GDP on healthcare while we spend nearly double that amount as a percentage of our MUCH LARGER GDP on healthcare with a questionable return on investment. EVERYONE was on the same page going into this jobs report. There were huge expectations that this number was going to approach 200k jobs and that the unemployment rate would start ticking down. When everyone zigs we should be zagging. The numbers just hit the wire and they're fugly. Retail trade, construction, manufacturing, and government fell. Prior months were revised upward slightly and the birth/death model had almost no impact this month (thankfully). All together this is a terrible jobs report. Here's where it gets tricky - the market has roared higher the last two days as the US dollar has weakened because people have overcome their fears of the EU bailouts. Will people sell into the rally after a terrible jobs report or will stocks surge on expectations that the FED will continue to pump money into the system to deflate our currency. It appears that everyone is happy with the current tailspin in the economy because the stock market has reacted positively to today's disappointing jobs report. Terrible news = Fed easing = weak dollar = higher stock prices. Yeah, we all win - except for the 15 million or so unemployed. +39,000 new jobs - remember the ADP data that got the whole market rallying on Wednesday showed +94k jobs. The ADP data has been terrible for close to 2 years now and I think we should really look at their methodology before reporting these numbers any more. Unemployment ticked up 0.2 to 9.8%. What's distressing is that this wasn't driven my some massive move of people rejoining the workforce. In, fact the opposite occurred and unemployment still went up. The average work week was unchanged at 34.3 hours in November and I think that leaves lots of slack in the system before hiring needs to resume. The number of people unemployed over 27 weeks also jumped in November for the second consecutive month. This might just be a temporary set back but this is a troubling shift in the data for the long-term unemployed. However, the ECB has joined the debt buying party (apparently buying bonds in €100 million blocks) and that has calmed the world for the week. We now return you to your regularly scheduled Ice Dancing with D List Celebrities. "The worst of the cheery chocolate-laden delights? Starbucks' Peppermint White Chocolate Mocha. A venti made with whole milk and topped with whipped cream is a jolly 700 calories with 27 grams of fat (17 grams saturated fat) and 95 grams of sugar. According to the piece that is the equivalent of 17 ½ candy canes." The numbers are all over the map for this report but the consensus has been moving up steadily all week and we could see a number between 150k-200k with the unemployment rate between 9.5% and 9.7%. The markets have run 3% in the last 2 days which could provide some fireworks. More news after 8:30am. A little bit of good news out of the UK - their manufacturing sector grew (who knew the UK manufactured anything anymore?) - and the spark was lit today. The market's exploded out of the gate and held firm going into the Federal Reserve's data dump at 12:00 when they revealed who accessed bailout trillions. At 10 minutes to noon Goldman decided they've seen enough to say the US economy has turned the corner and they are now bullish on the economy and that spike the market another 50 points in a minute. The ADP payroll survey also showed private job growth in November, but this data has been wildly inconsistent lately. We're still expecting a big 150k jobs added in November (again - it will be low end service jobs - restaurants, retail - replacing engineers and IT consultants). Expect the talking heads to start throwing around "It's a SANTA RALLY!" again soon.